In its commitment to deliver the most comprehensive all-media coverage of next year’s presidential elections, Eleksyon 2016, GMA Network forges ties with the biggest names in the fields of media, telecommunications, education, business, and public service. During the Eleksyon 2016 Memorandum of Understanding (MOU) Signing held on Thursday, October 8, at the GMA Network Center in Quezon City, GMA Network Chairman and CEO Atty. Felipe L. Gozon highlighted the importance of next year’s presidential elections. 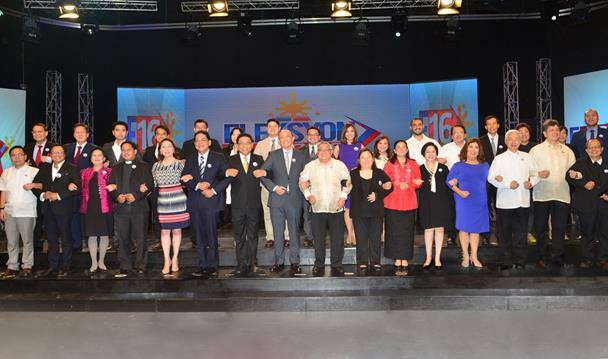 Joining forces with GMA Network for Eleksyon 2016 are partners from the Commission on Elections (COMELEC); PLDT-Smart Communications; Philippine Daily Inquirer (PDI); Philippine Center for Investigative Journalism (PCIJ); Inquirer.net; Catholic Media Network (CMN); Parish Pastoral Council for Responsible Voting (PPCRV); and National Citizens’ Movement for Free Elections (NAMFREL). Completing the Eleksyon 2016 partners are University of the Philippines (UP); Polytechnic University of the Philippines (PUP); Ateneo de Manila University (ADMU); De La Salle University (DLSU); University of Santo Tomas (UST); AMA Education System; Waze; Viber; Youth Vote Philippines; Philippine Entertainment Portal (PEP); Chamber of Commerce of the Philippine Islands (CCPI); and the Philippine Bar Association (PBA). With the said partnership, Eleksyon 2016 seeks to deliver a more efficient, in-depth, and credible coverage of the upcoming presidential elections—no less than what the public deserves.